My fifth favorite passion (aside from: family, fitness, reading and food:) is technology. Counted among my many blessings is being able to earn a living by literally playing for hours with all manner of digital geekery. Today, for example, my day was spent getting a new workstation (far left) online. 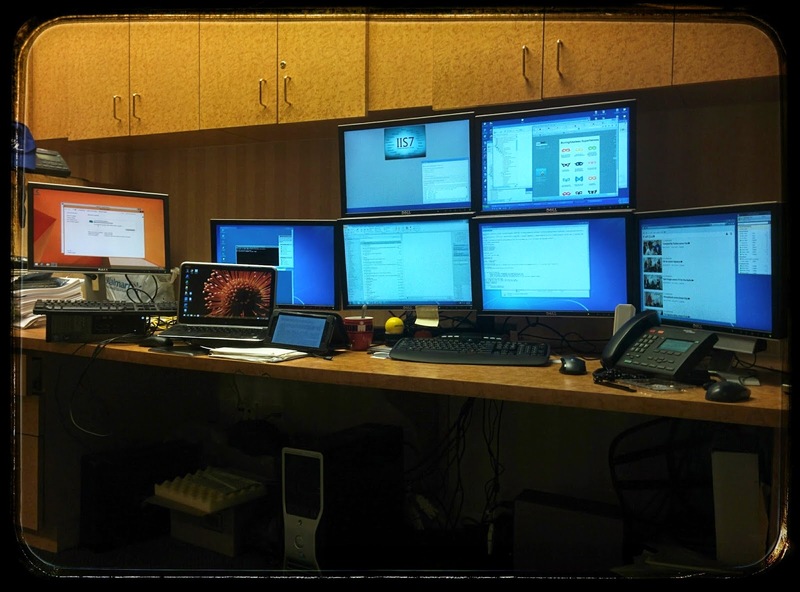 At one point, my desk had three PCs (with three different versions of Windows) straddling SEVEN screens. All controlled by just a single mouse & keyboard. For bonus Dork Points, my convertible laptop and much-beloved tablet are included in the group photo. Top two monitors (currently) work off my oldest PC, barely visible as a silhouette under the phone. Something like a Dell 520, from 2005. Runs Windows XP. 4GB of RAM. 70GB drive. Usually handles non-corporate adventures and has Office 2007 for helping users running that version. Bottom four monitors currently work off an oldish Dell XPS system, the silver tower under my tablet. Probably refurbished around 2012. Quad core, 64bit, 8GB RAM, 200GB drive, Windows 7. Monitors the data center, handles all corporate adventures, and has Office 2010. The laptop is a Dell XPS One that has stolen my heart. (Typing on it right now.) Also runs Windows 8.1. Also has an SSD. And boots from a cold stop to fully logged in within 5 seconds. Love it, love it, love it! Mainly use it for working remotely, and typing out my rants on Tales From The Eye. Great for watching videos, too! Of course the tablet is a 2nd generation Nexus 7. This thing will completely change your digital life. Only reason to get on my home PCs these days is to play a video game. Almost everything else done on a regular basis is done on the N7. Ultra portable. Ultra functional. This thing is a game changer. Tying all the Windows devices together with screen/keyboard/mouse sharing software: Synergy. Allows me to move across all the screens seamlessly. Could probably run it on the tablet, if needed, since Synergy has a Linux client. A keen eye will spot my favorite coffee up lurking amid the packets and LCDs. Something old, something new. Combine it all together, and you have the modern IronNerd. Welcome to my world.